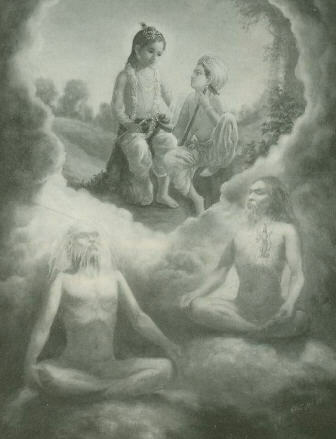 "Learned transcendentalists who know the Absolute Truth call this non-dual substance Brahman, Paramatma, or Bhagavan" (Srimad-Bhagavatam 1.2.11). SRILA JIVA GOSVAMI SAYS that these three features of the Supreme Truth are in fact one; but he uses "one" not to indicate a oneness that is amorphous in every respect, as impersonalist philosophers would have us believe the Supreme to be. Rather, he says that Brahman, Paramatma, and Bhagavan are one in the sense that they are three aspects of one integral absolute reality. The Brahman and Paramatma features the impersonal Absolute and the Supersoul within the heart rest on the Bhagavan feature, the Personality of Godhead. In that sense only there is oneness. The word advaya, or "nondual," means that no substantive difference exists between the three. They are of the same substance, yet they are different in how each is manifest and how they function. Differences are generally of three types. One type is that which exists between the self and the body. This difference does not exist in Krsna; there is no difference between His body and His self. A second type is the difference between categories, as between the self and the rest of existence. This difference also does not apply to Krsna, because everything that exists is manifest from His being and rests on Him. Nothing can exist apart from Him. Without Krsna there would be no "rest of existence" to speak of, just as without the sun there would be no sunlight. The third type of difference is what we may call difference within the same category. For example, as human beings we are all one, but within that general category we are of different classes high class, low class, and many other strata between. This difference does not apply to the transcendental manifestations of the Personality of Godhead. Even though He has unlimited expansions who may act independently of Him, by His inconceivable potency He remains the support for them all. None of them is truly independent of Him. Therefore they are all advaya jnana nondual or one. The final meaning of advaya jnana, therefore, is simply that although these three Brahman, Paramatma, and Bhagavan may be described and discussed separately, in the final analysis there is no difference between them. They are aspects of one common nondual entity, Bhagavan, who is ultimately Krsna. To develop this point further, Jiva Gosvami analyzes the Bhagavat tattva, or the truth of Bhagavan, the Personality of Godhead. Srila Jiva makes this choice of subject through the logic which states that the order of reading shows the order of meaning. Since the Bhagavatam speaks of the advaya jnana as Brahman, Paramatma, and Bhagavan, the order of meaning is that the last one named is the support for the previous two. Thus Jiva Gosvami writes his analysis of Bhagavan first, then the Paramatma Sandarbha, his analysis of Paramatma. Significantly, he chooses not to write a Brahman Sandarbha. He says that the impersonal Brahman feature, unlike the Paramatma, displays no separate qualities and no separate existence at all. So he sees no need to write a treatise on Brahman. When we have an object, we also have its qualities, and we have no need to discuss the two separately. If we study the sun, our analysis must automatically include the sunlight; we need not analyze the sunlight separately. Similarly, Brahman, being by definition the effulgent light from the body of Bhagavan, depends completely on Him for existence. So there is no need for any separate analysis of the featureless Brahman energy. Thus although the impersonal Brahman is the subject of so many volumes of books and is often venerated as the object of a high realization indeed the highest realization Jiva Gosvami does not bother at all to give it a separate analysis. For his next topic, he shows that the Lord's abodes, the Vaikuntha planets, are all made of spiritual energy and are therefore transcendental. He also speaks of the multifarious potencies of the Lord and proves that these potencies are not superimpositions on the Absolute. Impersonalists believe that variegated potencies appear only when Brahman becomes adulterated by maya. They say that maya has two potencies knowledge (vidya) and ignorance (avidya). According to the impersonalists, when Brahman is influenced by the vidya potency, it manifests itself as isvara, or God in a personal feature; and when Brahman is covered by the avidya potency, it appears as the living entity. That is their theory of how God and the conditioned soul both appear from one Brahman. Jiva Gosvami refutes this. He says that God's potencies are a natural part of His personality and are not derived or borrowed from elsewhere. Indeed, he says, maya is but one of those potencies. Just as heat and light are natural endowments of the sun, Krsna's potencies are natural and eternal parts of Him. As a natural part of His inconceivable nature, the Lord reconciles all opposing qualities and contradictions. For example, consider this question: If God is transcendental, eternal, and unlimited, how can He have a personal form and thus become limited to one place? Srila Jiva Gosvami says we must first understand that God has acintya sakti, inconceivable potencies. The Lord can therefore have opposing qualities and still be unlimited. For example, in one pastime mother Yasoda tried to bind Krsna by connecting so many bits of rope but each time the rope was too short. Yet it's not that the Lord became fatter and fatter each time she tried; He kept His normal size as a baby. In fact, the black thread tied around His waist stayed intact the whole time. This means that although He was limited, He was inconceivably and simultaneously unlimited, and therefore Yasoda could not bind Him. To insist that God couldn't function in this inconceivable way would be to limit Him. All contradictory and opposing qualities, therefore, reside in the Lord at the same time. That's why the scriptures make statements like "The Supreme Lord walks, but He does not walk. He is near, but He is very far as well." Such things are naturally possible for the Supreme Personality of Godhead. But because we try to understand Him merely in terms of our material experience and our puny logic, we fail. We truly begin to understand God only when we accept that He has acintya sakti, inconceivable potencies. But Srila Jiva Gosvami points out that "inconceivable" does not mean we cannot understand Him at all. Rather, it means we cannot understand Him merely by logic. But we can understand Him from the revealed scriptures, in which the Lord, for our benefit, gives knowledge of Himself. The moment we accept acintya sakti, we can at once understand so many facets of the Personality of Godhead. How Can Something Changing Be Eternal? Now Jiva Gosvami takes on the impersonalists again. They speculate that the Lord and the things related to Him are in the material mode of goodness. They say that understanding this is conducive to concentrating the mind and becoming fixed in the mode of goodness. But still they hold that we must ultimately abandon the Lord to progress further to the impersonal sphere. To refute such misconceptions, Jiva Gosvami takes great care to show that the Lord's form, abode, qualities, potencies, and associates are all transcendental, above the mode of goodness. They all exist in the Lord's internal energy, and none of them have any source other than the Lord. The Lord borrows nothing from elsewhere. In making these points, Srila Jiva Gosvami quotes numerous scriptural sources. Although the subject he is analyzing is Srimad-Bhagavatam, his general method is to give evidence from three additional sources. He does this to show that the conclusions culled from the Bhagavatam do not stand alone but are supported by these other sources. On all major points, therefore, he gives evidence from the Vedas, the Upanisads, and other Puranas as well. He also quotes extensively from the works of otheracaryas (spiritual masters) and of course from the Bhagavatam itself. In the Bhagavat Sandarbha, Jiva Gosvami establishes that the Lord's transcendental form, qualities, and activities do not undergo any transformations. This topic comes up because we see that Krsna seems to take birth, play as a baby, and grow to boyhood and then to youth. So He appears to undergo changes just like one of us. And how can an activity be eternal? Eternal means without beginning and without end. When we perform an activity, it begins and ends. And so too it seems with Krsna. When He eats, for example, He begins to eat, then He is eating, and then His eating is over. How can this or any other activity be eternal? In reply Srila Jiva Gosvami explains that none of Krsna's activities come to an end. Just as the sun perpetually rises somewhere and perpetually sets somewhere else, Krsna's activities go on and on without cessation, simultaneously appearing and disappearing throughout the creation in the untold millions and billions of universes. His pastime of birth on this planet, for instance, is simply that perpetual pastime becoming manifest. And the moment it is finished here, the same pastime at once begins somewhere else. All His pastimes go on like this in universe after universe. This gives rise to the next question. Why are His pastimes, although performed in separate places, accepted as one activity and not two different activities or even more than two? Jiva Gosvami explains that from Krsna's point of view it is all one action. If I call out "Krsna, Krsna," I utter the name twice, but logically I perform only one act I call Krsna. This is never counted as two actions. Similarly, when Krsna appears in one universe and then another, He performs not two activities but only one. And since He does this from universe to universe, the pastime is eternal. It only appears to stop and start from the viewpoint of human observers; for Him it is one activity. If this were not the case, Jiva says, devotees could not worship the Lord in any of His pastimes, because if a pastime were not in fact going on eternally it could not be an object of worship. When the devotees worship the Lord as the lifter of Govardhana Hill, for instance, they do so with the aim of joining in that pastime. The same is true for all the other pastimes of the Lord. The pastimes, therefore, have to be eternal, or the scriptures would not have prescribed them as objects for meditation. Sri Jiva Gosvami discusses this topic in greater detail in Sri Krsna Sandarbha. His next topic in the Bhagavat Sandarbha is the Lord's holy names. Jiva Gosvami says that the Lord's names are all transcendental and nondifferent from Him. But when we say Krsna's name we use our material tongue to vibrate it and our material ear to hear it. How can this material tongue say the transcendental name? How can the material ear hear the transcendental sound? Again, how can the Vedic scriptures deliver a transcendental message when they too are borne by material means, such as paper and ink? Srila Jiva Gosvami responds that this is all possible by the inconceivable potency of the Lord. By His mercy upon the conditioned souls, He gives us such ways to be purified of material desires. Thus even while captive in a material body, we can still perform nonmaterial, transcendental service to the Lord and gradually progress towards His abode. To achieve the Lord's abode is to go beyond salvation or liberation, and the pleasure in the Lord's abode far surpasses the bliss of merging into the Brahman effulgence. The spiritual sky is beyond time and karma. Jiva asks, "What does it mean that the spiritual world is beyond time?" It is beyond time in the sense that one cannot say that one will reach it by performing a certain spiritual discipline (sadhana) for a certain period of time. We may calculate that to drive from Calcutta to New Delhi at fifty miles an hour would take us thirty hours. The destination is not beyond time, and so we can refer to a time for completing the journey. But when we speak of attaining the Lord's abode, no one can make such a calculation. Therefore the Lord's abode is said to be beyond time. Beyond karma means that no material activity not even piety will take us there. The only means for going to Lord Krsna's abode is pure devotional service, which one gets only by the mercy of the Lord, through the agency of His pure devotees. Satya NarayanaDasa was born in a family of devotees in a village between Vrndavana and Delhi. He holds a postgraduate degree in engineering from the Indian Institute of Technology. While working in the U. S. as a computer software consultant, he joined ISKCON in 1981. He later received spiritual initiation from ISKCON leader Bhaktisvarupa Damodara Swami. He now teaches Sanskrit at the Bhaktivedanta Swami International Gurukula in Vrndavana and is translating the Sad Sandarbhas. Kundali Dasa joined ISKCON in 1973 in New York City. He has taught Krsna consciousness in the United States, India, the Middle East, and eastern and western Europe. He has written many articles for Back to Godhead and is now editing Satya Narayana Dasa's translation of the Sad Sandarbhas.